The measurements on this chart are actual body measurements and can be used as a guide to garment size selection. Measure around lowest part of neck. Measure around largest part of the cheest with arms at sides. Measure at fullest part while standing upright. Measure from crutch to heel of shoe - or take measurement from another pair of trousers. Mondopoint is a universal and standardised size system that takes the anatomic shape of the foot as a starting point. 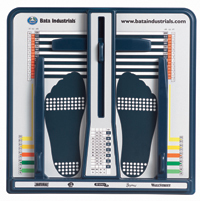 The Mondopoint size system Bata Industrials uses in The Natural collection has four widths per shoe size. It offers maximum safety, health and comfort. Once introduced to this system, wearers can count on a shoe with a perfect fit and optimal comfort. Below is an overview of Mondopoint sizes and the corresponding European and American sizes.